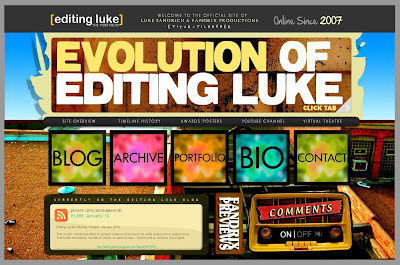 Ever since launching Editing Luke: The Portfolio (www.editingluke.com) earlier this month I've still found myself investing a lot of time into how the site is put together. Call it working out the kinks or just my obsessive attention to every detail with this project, but the energy and money I've invested so far in building my own unique online space, feels incredibly rewarding because of the potential it brings. In just the few weeks since the site has been up I've added a featured video element to each of the 4 genre pages of my portfolio section, have continued to compile edits, completed my interactive archive with a few more never before seen mementos, and most recently have updated my main page to feature revolving content (the 'evolution' banner above features the rotating links). My continued goal with all of this is to make accessing and exploring my work easier, more enjoyable, and expressly original. The main page is the biggest change from just a few weeks ago. 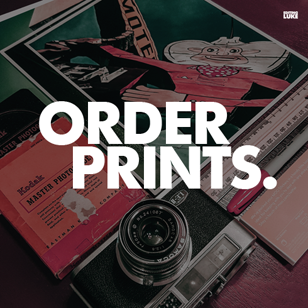 The slide show of banners allows me to highlight numerous posts, series, or videos that I feel are relevant, classic, or still in production. More than just a stylistic change, this format (much like my live blog feed on the main page also) allows people to see what I have going on and get a quick overview of things they may want to explore. As I continue to branch out it also allows me to pull everything together again, highlighting content from across the web in one convenient location. Like I've said so many times throughout this process, the portfolio site is meant to be a hub, and whether someone wants to view my YouTube channel, read my blog, or just get in touch with me, it can all be done from the main page on editingluke.com. I'm sure there will continue to be some major changes that I'll share with you as I continue to refine the site. The lessons I'm learning from doing this - plus also from working in two uniquely different media jobs during the day - is really giving me the skill to fine tune things to my own tastes. It's exciting to feel in control of something that I've wanted to do for so long. Be sure to stop by and check out the Archive section on the new site to see interactive materials from letters, notes, posters, and links to other online content - or just get lost in the pages I've created. To get a first hand experience of what I'm rambling on about, visit my portfolio site here. I like your blog. I feel it has a great color scheme and well put together elements. I think if you have this blog seo'd well then you will go really far with it Luke.